Lobby and pick up and drop off pattaya united, quality gym area, laundry services, panoramic rooftop deck. Convenience store, coffee shop and professional massage parlor on site. Take me to the condo listings. 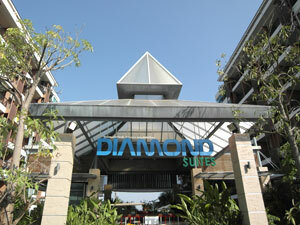 Diamond Suites Pattaya Thailand Facilities: Tropical pool area with water falls, safe parking, professional massage service, laundry services, gym, Convenience store and coffee shop. Luxury 2 bedroom corner condo on the 6th floor with pool views, European kitchen with oven, LED flat screen TV, internet, 68m2 fully furnished in foreign name. Rent: 20,000 – 40,000 Baht per month. Depending on season and length of stay. Contact Us Please make sure to check your spam or junk email folder after 24 hours if you do not receive an email from us. Please use the form below to inquire about a condo. We will be getting back to you within 24 hours. We always answer all inquiries and the more you can tell us the better we can serve you.